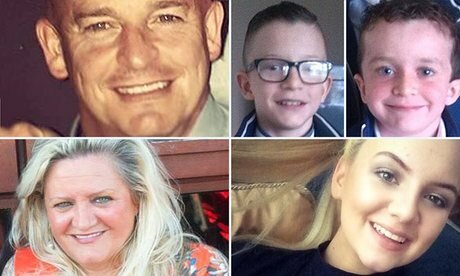 The beautiful poem read out by the mother who lost five members of her family, including her two children, in the Buncrana pier tragedy has been turned into a poignant song. 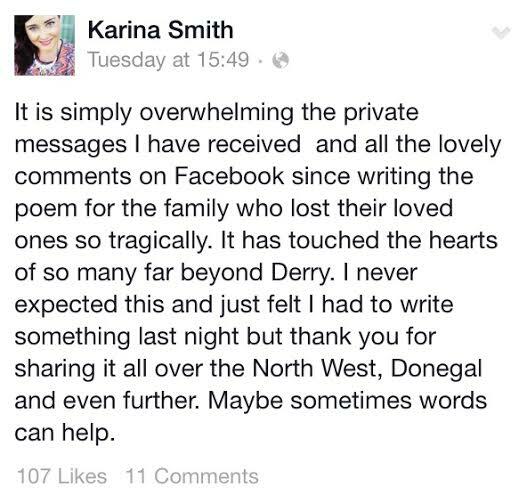 The poem, simply called Rest In Peace, was written by Derry poet Karina Smith as she became one of the many in the city who was struck by one of the worst tragedies Ireland has ever seen. 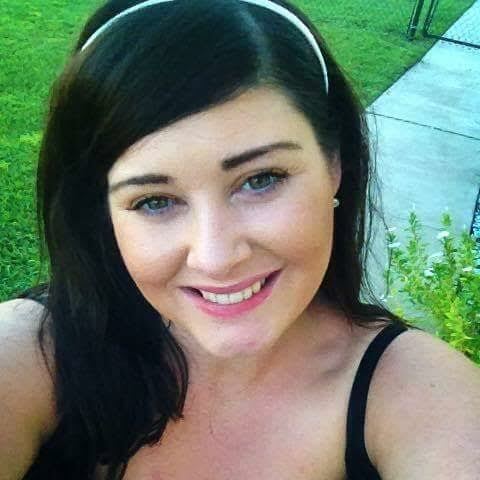 Karina, 30, wrote the poem to express the city’s grief for the family who died after their car went out of control and slipped in to Lough Swilly in Buncrana, Co Donegal on Sunday. And last night Derry singer Jacqueline McKay, added to this artistic tribute to the dead, by transforming the poem in to a melancholic song, which has been posted on YouTube. Karina told Ireland Today: “I really wanted to bring a bit of light to a dark, sad situation so my choice of words in the poem were very important. I knew the family were only on the pier to watch the sunset because it was a beautiful day down there and I know when I think of the sun, I think of heaven. “My aim was to hopefully help Louise try to see even just a little beauty in a very horrific tragedy. Yesterday Louise James, the mother of Evan, 8, Mark, 12, and partner to Sean McGrotty, 49, read the haunting poem in memory of her family at their funeral. Louise’s mother, Ruth Daniels, 59, and younger sister, Jodie Lee Daniels, 14, also died in the tragedy that has rocked the Inishowen peninsula and Derry, the family’s city. 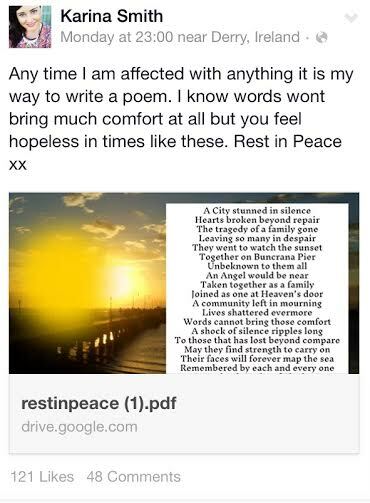 Karina wrote the poem on her personal Facebook in the hours after the deaths to help the community cope with such huge loss and said a family member contacted her to ask if the powerful words could be spoken by Louise at the funeral. “I did not know the family personally,” Karina said. “But simply felt I had to write something to bring a bit of comfort to them. I uploaded my poem and it was shared more than 1,000 times. I couldn’t believe I touched so many people. A family member contacted me and asked me could Louise James read my poem out at the funeral and I was so completely honoured. 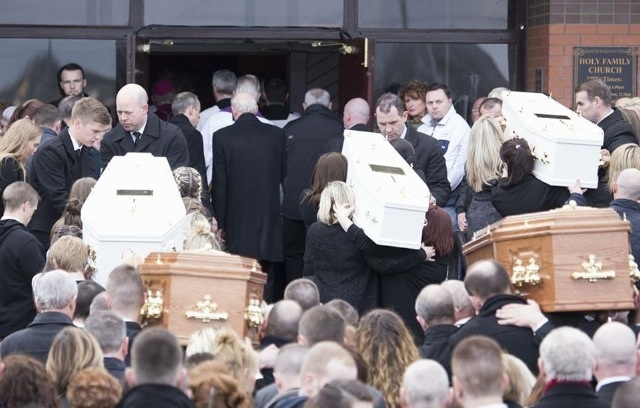 Sadly Karina, who had planned to go to the funeral at Holy Family Church in Ballymagroarty, Derry, could not attend because her own mother was taken ill and brought to hospital. 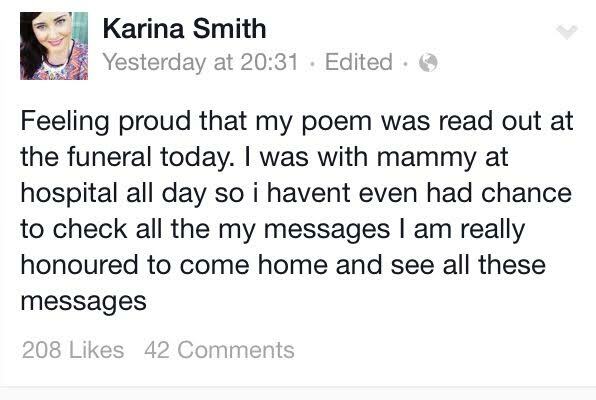 When she finally made it home yesterday evening, Karina couldn’t believe the outpouring of support she had received on Facebook for the poem – comforting her as she worried about her mother. “I wasn’t even able to go to the funeral as the doctor knocked at my door at 12pm in a complete panic to see my mother, who has been very ill and I am caring for her. She has pneumonia. “I was just told the day before she has pleurisy. The doctor told us to get to the hospital right away so I missed the funeral. Karina writes poems for local people. She has a poetry business and pens words for every occasion – even this bitter one when it seemed there were no words to express such colossal loss. “I frame the printed poem for a forever keepsake,” Karina said. The sole survivor of the tragedy was two-month-old Rionaghac-Ann, Louise’s baby girl, rescued by footballer Davitt Walsh from the water. 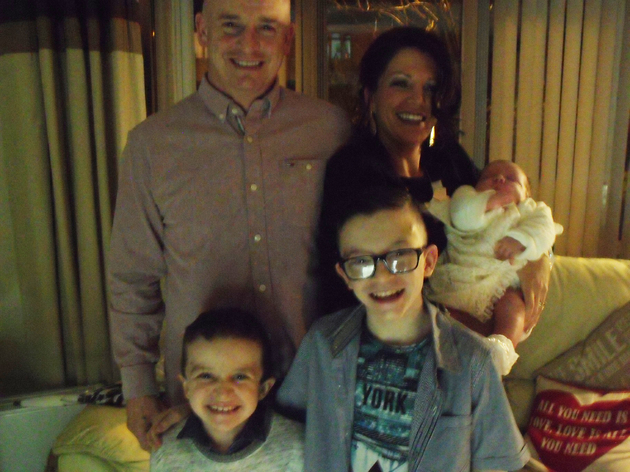 The baby’s father, Sean, had handed the child from the window of the car to Davitt moments before the vehicle was sucked down in to the lough. Davitt has since been hailed a hero and calls have been made for him to receive a presidential award after he swam out to help the family. The Kerryteel footballer has since met with Louise and a touching photograph of him being reunited with the baby girl, cradling the infant in his arms, was taken.